I’m sorry this is so late and so long. I have been trying to get this right for two days now and it is always way too long. It’s 10 minutes long, so it probably too long to show in class, but I thought I would post it anyway. In the event that there is no time for it to be played in class, I will probably present on wednesday. After immense personal struggle, I have finally accepted the fact that I cannot embed the timeline. here is a link, I admit defeat. I don’t remember not knowing how to read. My mother, when going through the old storage boxes of childhood artifacts during her biannual cleaning ritual, usually pulls out the book Are You My Mother by P. D. Eastman, and starts reminiscing about how it was the first book I ever read. This is what I remember most about the book- not me reading it for the first time, but my mother explaining that it was my first book. The pages are torn in a way that is so familiar to me that when I see the book in stores it seems weird that they aren’t torn like that. I was (am) an only child, which kind of explains a number of phenomena surrounding my childhood (such as the dreams). The most important of these and the theme of this narrative is my love of stories. What I think is most ironic about this whole thing is my lifelong hatred of writing. As a child I would dread putting even a few words down on paper, it was an agonizingly boring process. I don’t know if it was because I didn’t know what to say, or because I simply hated spelling things out on paper. I think it was a combination of these things. This, of course, did not mesh well with my constant spinning of wild tales in my head and the vast and confusing nightmares that plagued my childhood. I think if I had kept a journal I would have had a lot more clarity of mind. As much as I hated writing, I loved to read. Through reading stories and relating to them I learned valuable things about myself and the world. When characters in my head did the same things as characters in books, it gave me insight to what motivates people to do these things. As a child my greatest frustration would be a lack of books. Or the lack of ways to obtain said books. Which is why when I got my phone and discovered ebooks it was a huge deal. I have never met another person that was as excited by them as I was, but the sheer easiness of reading on my single, onmipurpose device anywhere I went and without people seeing what I was reading (I’m kind of a private person) was great. Later in my life, my nemesis Writing became more difficult to avoid, as there were always essays to be written and lab reports to be done and proofs to be explained. Mostly the essays, though. It was around this time that I started to enjoy the challenge. The challenge of writing. Not the writing itself. Very important distinction. About the timeline: I really wanted to expand on the concept of “narrative”, so the bulk of the story is written within the format below. Above is only a brief iteration. Seeing as this is a more personal project, I decided to write it in a more casual tone that I normally would for a school project. I also thought this was fitting for a project on “Digital Literacy”, seeing as technology and modern communication go hand in hand. I know that it is supposed to be a visual aide, but the concept of writing a story through the use of a tool like this was very appealing. I am turning this project, which I have made narrative the theme of, into a narrative itself- just as I organize my life, in which stories play a huge role, into a giant story. I hope it is interesting. The entire process of creating this timeline gave me a new depth in perspective and understanding of my development as a writer thus far. It’s crazy to see where I started, struggling to write my own name to now writing articles for one of the largest online music publications on the web. Not only did this activity give me a feeling of extreme accomplishment, but it also gave me the insight that I still have a ways to go in my development and journey as a writer. Who knows where I will be as a writer in 19 years, I hope it’s as much improvement as I have experienced in the past 19 years of my life. With that said, let me elaborate on what has occurred in the past 19 years and what it has meant in my development not only as a writer, but as a person as well. I have always held reading and writing as things that were extremely important and comforting to me; I think that I held both these activities to such a high degree of importance because they helped me escape reality. Now when I was younger I was a lot different than most kids in my town. I didn’t really enjoy sports and had more of a craving for the creative, and what I mean by that is that I was a very imaginative child. Knowing that, its no surprise that later on in life I would come to love and appreciate comics and music so much because both are attributed with imagination and creativity. Music in particular, developed into a huge influence later on in my life. In eighth grade I analyzed and rewrote a rap, which was the first instance where I combined my love of rap music with writing. Reminiscing on these memories, which are staples in my development as a writer, has rekindled the fondness I have for these events, which have played such a huge part in the development of the person I am today. From writing that initial paragraph in second grade to the writing of my first analytical essay when I was a freshman to my first blog post ever as a Junior, mark the key events in my evolution as a writer. It’s funny to think that the first paragraph I ever wrote was a description of myself and my interests as a person and now if someone were to ask me to describe myself I would say that writing is a huge part of who I am and practically defines me. The major take away from this timeline for me is that in order to insure a better future for yourself, one must have a complete and thorough understanding of the events that made you the person you are today. Now that I have taken time to deconstruct the significant writing and reading events of the past, I now have a better understanding of my roots and the attributes I have utilized in the past that have allowed me to accomplish and overcome these challenges. Overall, I have sincerely enjoyed creating this timeline and remembering the events that led to me becoming a writer. If your interested in seeing what makes me who I am, check out my timeline by clicking here: TIMELINE. My digital life began early, from when my parents began my foray into the digital age with what would advent my computing career: the iBook clamshell. This seemingly advanced computer pretending to be a creature of the sea provided me with a much-needed outlet for my creative endeavors. Namely the introduction of drawing and key mashing that provides for every 4 year old the necessary activity of pushing his finger into technology. Realizing my potential as a writer at the early age of 4, my parents enrolled me in preschool. Claiming that it would benefit us later on in life, my preschool teacher set out to teach my classmates and myself the ever-necessary art of cursive. Now ignoring the blaringly obvious fact that cursive has never helped me in life, we move on. Out of the clamshell and into the sea, my key mashing techniques furthered with the introduction of typing games on PC computers. Instead of using all my fingers, though, I learned to cheat and type quickly with only two fingers. While at the time it seemed harmless, my teacher disapproved and helped me in time to gradually find my rhythm on the cheap plastic keys that outlined the windows XP interface. Blazing through the Oregon Trail computer games and my first phone (with snake and Tetris demo included), I delved into the world of speed-reading having barely experienced normal reading. In hindsight this was a good idea (mostly for standardized tests). Fluency reading, as they called it, involved me quickly reading passages of writing out loud to my class for prizes. In hindsight, such prizes were not worth the annoyingly fast pace of my speech now. Persuasive essays marked my ascent into adolescence. Embarking on my first literary journey, I wrote a persuasive research paper on the nature of the relationship between the musicians of Led Zeppelin, Jimi Page, and Robert Plant. Hoping to use my paper as fodder for why they should be inducted into the Rock and Roll Hall of Fame, I later found out that they had already been inducted in 1995. Growing up in the 2000s, I always had the option of either typing or writing my essays by hand and I usually chose the latter. Having temporarily lost my hand at physical tasks like typing quickly on a computer, I rekindled it by learning the saxophone and trumpet as my eyes learned to read and register sheet music. Facebook was when my desire for computers began to wane. Realizing how terribly lame it was, I gave up on poking and forever retired my all my fingers except my thumbs which I saved for my smartphone. Until more recent years, where I picked up a bit of coding, I avoided my computer for all but YouTube and Netflix. This class will be a rebirth of sorts. As I began to wrack my brain, trying to think of all the seminal moments in my digital timeline, I realized that I had a problem. It was not that I was dealing with a dearth of dates, but rather the opposite. I had never really given the topic considerable thought, but as my mind wandered back, I began to realize just how important reading and writing, as well as their transition into digital forms, are in my life. I understand that that last sentence may seem obvious, but such activities have are so common place that I tend to forget how critical they are to experiencing life as we know it. Without them, I wouldn’t be writing this, nor would you be reading it. Without reading and writing, I do not even know where we could be, if we could be. Getting down to it, my affair with reading and writing has been, like most men and women from my background, a life long affair. This narrative not only made me think about my past, but made me appreciate, deeply and truly, the opportunities that have been afforded to me. Without good schooling from pre-kindergarten to today, or, just as importantly, a family that understood and valued education, I would be leading a much duller life. From the fat pencil to receiving my first laptop, elementary short stories to twenty-page research papers, I marvel at how far I’ve come and how quickly technology has been running beside me. Though we do live in an age of the ever faster, slimmer, and sleeker device, there are a few notable moments on my timeline when that trend had been reversed. Perhaps it is a unique version of simplicity, or maybe it is just want for diversity, but there are some aspects of my literary journey that counter what one might expect. Rather than type and print certain works, I derive a special pleasure from hammering them out on a manual typewriter. Instead of typing and recording all of my journal entries into a nice folder on my desktop, I scrawl them down with pen and paper. Unlike a larger and larger percentage of readers, I prefer to imbibe my words from a page of pulp, not pixels. And I am not alone. Though the wider trend is towards digital means of consuming media, there is also a rising push to preserve certain platforms, if only for the nostalgia or the novelty. I doubt we’ll ever dig back to the stone and chisel, but older forms of communicating, the letter for example, have certain personal, even romantic qualities to them that set them apart from the digital era. Stories as well play an important role in my digital literacy narrative. From early picture-laden tales like Anansi the Spider, to text based adventure games, the art of story telling has always captivated me. Along the way, longer series of novels received large amounts of time that I was more than happy to give over. Before flicking through this timeline it is important to understand one thing: this is but a small sampling of those moments in my life that resonated with me until today. Left unrecorded here are all the small moments where a single word made my day, or where bitter joke ruined it. Omitted from this digital timeline are all the late night Skype sessions with friends and those who were quite a bit more than just friends. Left out are all the times simple comments on youtube videos or news articles opened my mind to a new way of thinking. To include these moments would be to include the entirety of my life, and that is one thing technology cannot do. At least not yet. When I started coming up with events for my digital literacy timeline, I couldn’t come up with anything. Then, I thought a little more and put down incidents that were not necessarily life-changing, but were quite meaningful in shaping who I am today. After having a concrete idea of what I would include in my timeline, I saw that there was a common theme between the stages of my digital literacy. This theme pertained to my values, my global perspective and my most central interests. Essentially, these points represent me very well and I would have never thought that my use of writing, reading and technology would define me as much as it does. Learning how to read and write around the age of five is a milestone that most people go through. However, I became literate in Spanish because I moved to Barcelona before I learned how to read and write. Already, my first written word was in a language that was not my mother tongue, as I am from Brazil and spoke Portuguese. This brings up an event that happens just a few years ago, in sophomore year of high school, when I read my first book in Portuguese. It was extremely ironic that I could read and write properly in English and Spanish but took much longer to do that in my first language. The following steps, that still relate to the idea that I am a global citizen, is the fact that I started learning new languages such as Dutch and French. Therefore, I was exposed to new vocabulary through books and it made my literacy more holistic. What is interesting is that I don’t remember how to speak in those languages as much as I am proficient at reading and understanding them. It is odd but learning it in class and not practicing it in conversation has made me frame my knowledge of the languages through texts. Moreover, studying Mandarin through tutoring while I lived in China was a whole new experience with my literacy because I delved into learning characters and it changed my prior perception of writing. The characters require a certain sequence to be written and are basically drawings. Then I started exploring my religion/ethnicity by going to Sunday school to learn Hebrew and then went on to study for my Bar Mitzvah. Through that, I was able to start reading Hebrew but still don’t understand what I am reading, even though I somewhat understand the language. Moving around and travelling brought me to buy an Amazon Kindle and then I could read as many books as I wanted without having to carry them around wherever I travelled, which proved inconvenient for long trips. Later I moved back to Brazil, after eleven years abroad. This was a huge shock for me because I didn’t fully grasp my own culture. Then, protests started happening against the government all around Brazil. I only watched CNN and BBC, as my news sources, and felt that there wasn’t enough international coverage on the protests and so I got a Twitter account only to tweet about wanting more attention to be given to what was going on in Brazil. I was successful, as the next day I was emailed that CNN acknowledged my concern and was going to focus more on the protests. This moment of political advocacy led me to start writing about social justice issues on my school’s magazine The Talon, specifically about women’s rights. This ran along with participating in Model United Nations, and there I developed an ability to write resolutions and make them compelling. I wasn’t just more political by using my literacy; I was using it creatively as well. I began to explore my more artistically literate side when I started writing scripts on Celtx for film class, but they were still quite politically driven. Finally, my literacy has led me to the final stage of my life, in which I am in now. I got here by writing my college applications. Now that I am at NYU, I have subscribed to the New York Times online and home delivery, but I feel like I will just have the online version because paper takes up too much space and kills trees. To have some mental health, I have also started journaling to connect with my thoughts for only a few minutes and also record my time here. Overall, my literacy demonstrates my background and has evolved to take me to where I am today. The story of my digital literacy dates back to preschool as far as I can recall. It all began with pencil and paper, as I became quite influenced by one of my teachers. She believed I was some sort of artistic genius just from looking at what I would draw and was my inspiration to begin painting (but that interest didn’t last long at all). It didn’t seem to matter much at the time, but drawing and painting were my first forms of expression and I feel that it makes them somewhat important for orienting the context of this timeline. As I entered elementary school, I had already been acquainted with a computer at home and started playing videogames almost constantly in my free time, while at Wolftrap I learned how to read and write the alphabet. The importance of videogames and this area of technology was mostly magnified by my dad and his side of the family, who were really into a game called Diablo 2. It was odd actually, the entire family would gather together to play the game cooperatively at times and I think what I began to crave most was finding more games like this. Perhaps it was because I had some of my best memories during my early childhood just playing that game with my relatives and I realized it was more than just a game but a way to connect with people. Throughout the later years of elementary school, I still spent plenty of time on the computer, but meanwhile I became a fanatic of fantasy and fiction novels and would read straight through an entire series as fast as I could. Simultaneously, I was drawn to movies like the Lord of the Rings trilogy and Harry Potter of course (though I refrained from reading them until much later and I have no idea why). In middle school and early high school, social media played a much bigger role in my life than I’m willing to admit. It was mostly Facebook that I wasted my time with (and still do) though I was never a fan of actually making posts. When I got my first smart phone in 9th grade, the amount of time I spent communicating digitally drastically increased and ever since I’ve felt less human for constantly retreating to the cyber domain to talk to people. In my last two years of high school, I became much more aware of the intellectual importance of almost every art form, including literature, film, music, and even videogames. It began when I started listening to a much wider range of music and ended with the discovery that gaming has always been an art form in it’s own right, I just never took the time to realize why I played and what games meant to me. So my story has a quite strange beginning: I could not speak until the age of 3. While I was doing speech therapy, my mom had the ingenious idea of reading to me every night as a way of communicating with me through books. My earliest memory is of me reading a Ladybird nursery book while my mom made strange noises (that was her way of trying to get me talking). 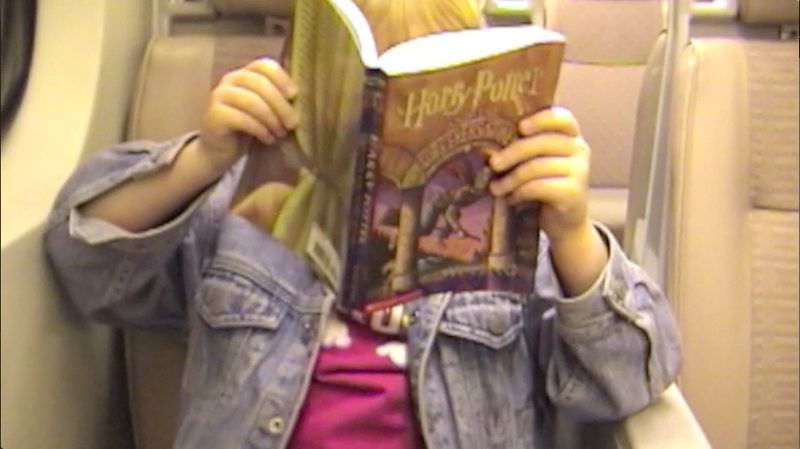 As you can see, I learned to read before I could even talk. Literature has ever since been a part of who I am. I read books like I breathe air. 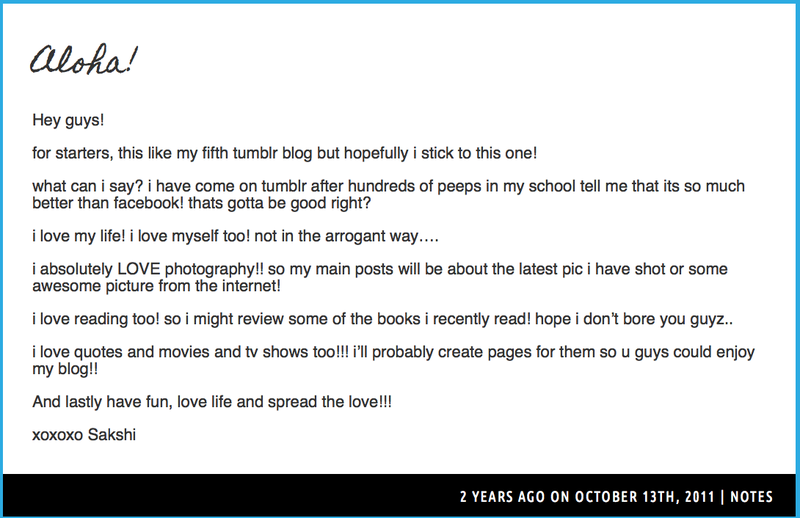 I have also been an avid blogger since 2010, when I created my first Tumblr account (the Tumblr blog I use now is from 2011). My love for blogging compelled me to create a short-lived WordPress blog about women’s rights and their contributions to society. Through blogging, I realized I could be an activist of social change. I became more active in this arena when I started working at NGOs and village schools where I taught poor children English. Embarrassingly, this was my version of being ‘cool’ when I was 15. 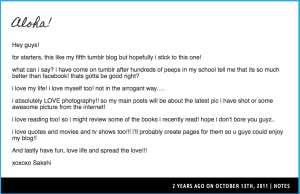 I became serious as a writer when I created my first (and probably only) digital magazine on teen health. It was an exciting experience that made me realize that I loved writing. I also wrote my first published article on personal care, which appeared in an independent magazine called one8one. But when I had to write a short story for my English class, I realized that I was more of a ‘non-fiction’ writer because I like writing about life and the world. However, the year 2012 was a very hard time for me personally as I had to deal with the loss of a loved one. Thus emerged my phase of journal writing that started from the creation of an online journal, which changed to an art journal and finally became a paperback diary. It was an experience that transformed me as a person and a writer, because I was able to vent my anger and frustration and also reflect on my life. Journal-writing was my therapy and a way to cope with life. It was interesting to condense my experience with media in this narrative because I could see the growing role that it played in every aspect of my life. Throughout the process, I realized that media has also had an overarching presence in my writing. It has challenged me as a writer and allowed me to explore my hidden depths. No matter how many people curse modern media, I am confident when I say that I have become a better writer because of technology. Reading and writing have always been very influential parts of my life, and various forms of media and technology have played important roles in shaping the development of my literacy. I started learning how to read using the Hooked on Phonics program, which uses board games, card games, and videos to increase vocabulary and make learning to read fun. When my younger brother got old enough, he and I would play with Hooked on Phonics every day. Our favorite game was learning how to read. Our competition continued with computer games that were centered around puzzles and challenges related to reading, grammar, and sentence structure. My love of storytelling caught flame when I picked up a copy of Harry Potter and the Sorcerer’s Stone. In middle school I discovered a love for writing and explored it in every way I found possible. In sixth grade I started a newspaper for homeroom called “The Hazard Headlines” using the Pages program on my home computer. Journaling about my day-to-day life became an essential part of my weekly routine. At the end of eighth grade, I got to write a story about a third-grade student from my school and give it to her as a gift. This project, written on my Mac desktop at home, was my longest work of writing I had ever done at the time. It was very exciting to see my story be published and read by a younger student. In high school I continued to find new ways to tell stories and work with different kinds of media. Through my high school’s video production program, I got to write and direct short films. Most of my projects, including “Doodle” and “Ursula,” were written on a script-formatting software called Celtx, shot on Sony cameras, and edited using either Final Cut Pro 7 or X. Some, like “Alex Hanson…In the Form of a Personal Essay” or “Creative People Are Drawn to Creative People: A Proof” were documentary style movies that didn’t utilize a script, but still involved forms of writing in the production. My personal essay was structured by a voiceover compiled of journal entries from my middle and high school journals. “Creative People” showcased the artistic endeavors of my friends, including their scripts and poetry, but was also accompanied by a related Storehouse blog made up of text, pictures, and short video clips from the documentary. In addition to video production, I sought out more forms of writing and sharing my work. I continued journaling and started doing more creative writing outside of class. Each year of high school my writing and art was published in my school’s literary magazine, “Reflections.” In my senior year I became a co-editor-in-chief and utilized InDesign, Photoshop, and GoogleDocs to put together the publication. The summer before my junior year, I interned at Tone It Up!, a company that promotes women’s health and fitness through workout and nutrition programs. During my time there I got to see how media and business work together by managing Twitter feeds, Facebook pages, and blog posts to connect with the company’s large consumer base. I put those skills and my creative writing together when I started my own personal blog the summer before my senior year of high school. Alex in Wonderland is a Blogger site where I post my short stories, poetry, art, short movies, and ideas. All of this experience with reading, writing, and media came to be incredibly useful when I applied to colleges in the winter of my senior year. College applications, submitted through online application portals, require not only a significant amount of writing experience to speak of, but a tone that emits both personality and intelligence, which only comes by practicing often. This picture was featured in my high school’s newspaper when they ran an article about student bloggers. I found a love of poetry through Poetry Out Loud, a national recitation contest in which contestants choose poems from an online data base and memorize them for recitation contests at their schools. I participated in this program my sophomore through senior year. At the tail end of my senior year I participated in open mic nights to practice my recitations and share my work. 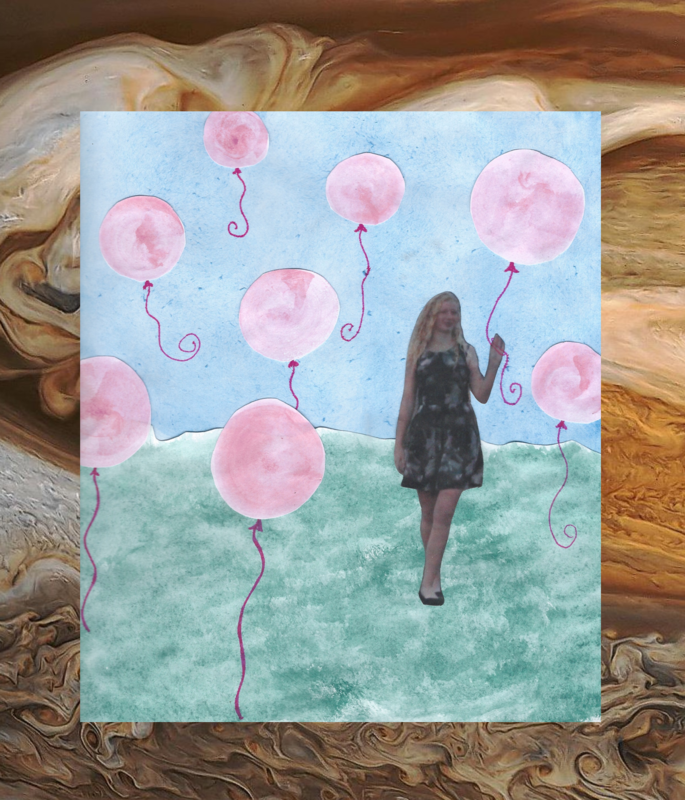 A collage illustration for “Jupiter’s Pink Balloons,” a poem that is both featured on my blog and that I recited at Coffee Cartel and In-House Arts. Whether it be through VHS tapes, paperback books, handwritten journals, blogging platforms, or pure memorization, the technology that has influenced my relationship with reading and writing has varied throughout the years. Creating this timeline has been eye-opening to the wide variety of forms of reading writing I have experienced in my lifetime so far, and leaves me excited to see how technology will shape my applications of writing in the future. My digital literacy timeline showcases these important elements of my life, how they affected me, and the tools used to build and interact with them. Where applicable, the events include links to the short films, blogs, poems, and websites I refer to in my timeline.